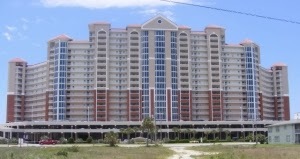 You can expect great rentals in this 2 bedroom, 2 bath 11th floor condominium overlooking the Gulf of Mexico in Gulf Shores on the Alabama Gulf Coast. Two bedrooms and a bunk room. New flat screen TVs. The condo is being sold fully furnished. The location in Gulf Shores within walking-distance to restaurants, entertainment, and shopping. Enjoy the resort’s 635-foot private beach, hot tubs, and Gulf-view fitness room with sauna or cool off in the two private Gulf-front pools. One, a zero-entry pool with four waterspouts, is perfect for children who can walk into the gently-sloping pool at ground level. Guests may swim year-round in the heated indoor pool. These Gulf Shores vacation rentals make for the perfect family beach vacation.